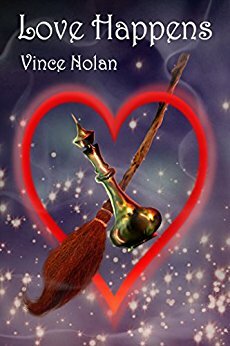 Vince Nolan’s Love Happens presents a fast-paced love story with a creative magical twist. Like many love stories Love Happens can trace its roots to the Bard’s Montagues and Capulets or perhaps the Sharks and Jets of the Bernstein/Sondheim collaboration. Nothing wrong with finding inspiration in the classics. The trick is to let that inspiration take readers somewhere unexpected. Readers may think there’s nothing new to spin from these classics, but Nolan’s story of forbidden love between a genie and a witch quickly proves them wrong. The tale unfolds in three main sequences, the courtship, the conflict, and the conclusion. While there is plenty of action, this is not a prose heavy fantasy story. Nolan limits his world building urges to just what is needed. Despite this being his debut novel, he slips bits and pieces into dialog with the skill of an accomplished screenwriter. Readers learn what they need to know, when they need to know it. This understated style allows readers to focus on the essential element of the story – the forbidden love of Becca and Ram. After overcoming their mutual dislike for each other the lovers’ fathers plot to secretly destroy their marriage. Nolan sprinkles in just enough humor to offset the dark timbre of parents scheming to ruin their children’s lives. The overall effect is a well told tale that hits the familiar love story points from a wonderfully different perspective. While written for adults Love Happens contains no explicit or foul language. The story contains a few references to sexual situations, but Nolan is an author who recognizes the power of a reader’s imagination. As such this is a romance that’s entertaining for adults and a safe entry point for young adults not interested in dripping romance scenes. There are a few scenes with magical attack sequences which Nolan keeps vivid without the need for graphic description. If Hollywood turned Love Happens into a movie and remained true to the author’s vision, it would receive a PG rating. With that qualification, I highly recommend this well told story to anyone interested in a light refreshing take on love and family.